At 75, Tanglewood's Student Program Holds Focus On New Music And People Making It : Deceptive Cadence The Boston Symphony's summer program for young musicians has long been commissioning works and fostering new talent. 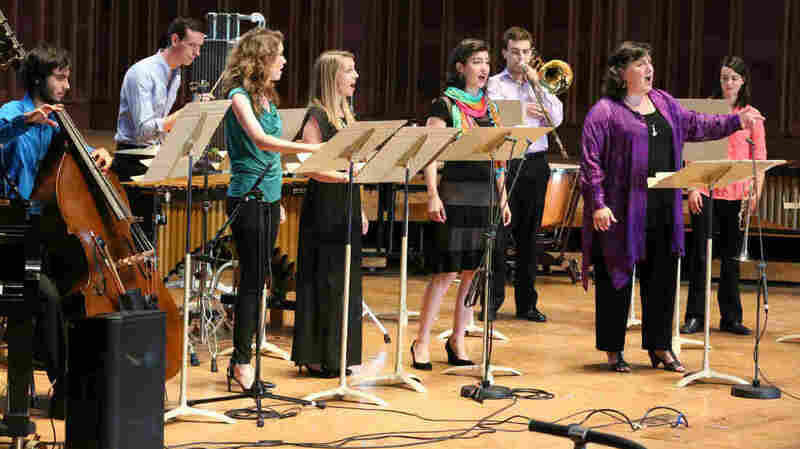 Soprano Dawn Upshaw (second from right) and fellows from Tanglewood's summer program performed the world premiere of Michael Gandolfi's Carroll in Numberland July 25. The list of its faculty and students is a who's who of 20th-century music: Aaron Copland, Leonard Bernstein, John Adams, Augusta Read Thomas. 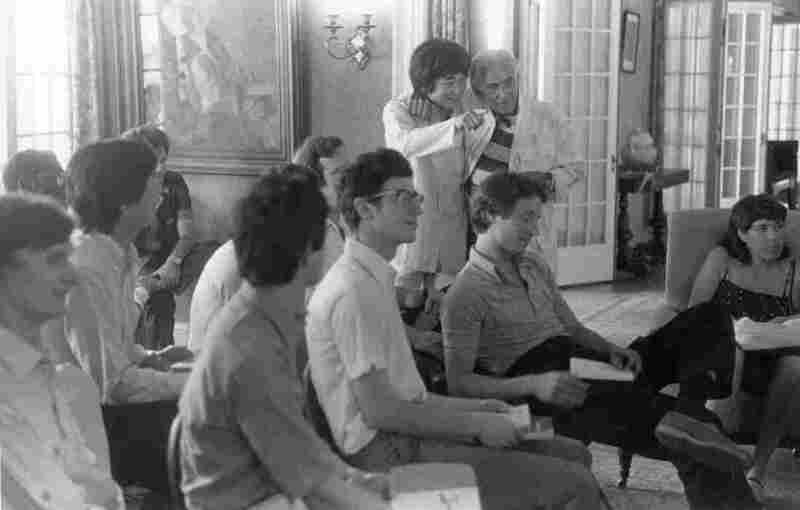 The Tanglewood Music Center, the Boston Symphony Orchestra's summer program for young performers and composers, is still going strong in the 21st century — and this summer, it's marking its 75th anniversary with a look back at what has kept it that way. In 1940, while Europe was at war, Serge Koussevitzky, then the conductor of the Boston Symphony Orchestra, began what can only be called an optimistic endeavor: He convinced his colleagues to open a tuition-free music school for talented conservatory graduates in the orchestra's summer home in Massachussetts' Berkshire Mountains. But two years later, it almost came to an end, according to Jeremy Eichler, chief music critic for The Boston Globe. "The BSO trustees wanted to close the school because of the war," Eichler says, "Koussevitzky was outraged and wrote a letter calling it an 'act of artistic vandalism,' and said, 'Precisely now is the time when the world needs to be hearing this music.'" "This music" wasn't just Beethoven and Brahms, but the sounds of the time. So to head the new school, Koussevitzky chose Copland, says the TMC's current director, Ellen Highstein. "In establishing Aaron as the head of the school," Highstein says, "not as the head of composition, but the head of the school, he was making a very specific statement, saying that it all starts with music's creators, and that one must absorb the creation and the immediate dissemination of new work as part of the DNA of what makes good musicians good musicians. And I think he felt very strongly that paying attention to the music of one's own time is the way to ensure that there will be a future." The first head of the composition department was a refugee from Europe: Paul Hindemith. And right from the start, they decided that what was then called the Berkshire Music Center would be a place for commissioning new work. Their first premiere was American composer Randall Thompson's Alleluia. "It was not done until, I think, almost minutes before it was handed out to the students at the convocation to sing at the first one," Highstein says. Thompson's piece has opened the program every summer since. Over the years, the Tanglewood Music Center's young instrumentalists, singers and conductors have performed many distinguished new works, from the American premiere of Benjamin Britten's opera Peter Grimes to the world premiere of Osvaldo Golijov's Ainadamar. This year, for its 75th anniversary, the TMC has commissioned 34 new pieces. One of them — inspired by the poetry of Lewis Carroll — is by Michael Gandolfi, who co-chairs the composition department. He wrote it for another faculty member, singer Dawn Upshaw, to perform with several of the fellows. Gandolfi himself was a student at the TMC, where one of his teachers was former fellow Leonard Bernstein: "I would see him on the stage," Gandolfi says, "I would see him on television, I would read about him and I owned his recordings and his music. And then, to have him standing right there and looking at my scores, it was really ... well, I'll never forget it! And he was tough. I mean, he gave me some really wonderful advice, but he didn't pull any punches. And he was like that with all of us." One of Gandolfi's students this summer is 31-year-old Nathan Shields, one of six composers in the program. Shields says the pace is intense. "In the first week, for three days in a row, we were told to write a piece every day," Shields says. "And so we would sit down with Michael Gandolfi at 10 o'clock in the morning and he would give us our instrumentation for the day. He said, 'Today, you're writing a piece for violin and viola. Go!' And we had to have that into him by 10 o'clock the next morning, at which point, he gave us a new instrumentation. It's sort of exhilarating to know that you can do it." The TMC composition fellows got to meet many of the commissioned composers both formally and informally, says Pulitzer Prize winner John Harbison, who also co-chairs the composition department. "An awful lot of their season this year," Harbison says, "is encounters with quite distinguished or experienced people. That's very interesting. It's a big opportunity." One composer who wasn't there was Gunther Schuller, who ran the TMC for 14 years and passed away just as this year's session began. Gandolfi says his former teacher remains a force in the Berkshire Mountains and beyond. Schuller "was such a polymath, if you will," Gandolfi says. "A publisher, conductor, author, horn player — great horn player — a great composer, educator, so on. So, it rings through the trees here at Tanglewood — you know, his influences." But Shields says that new music, and those who write it and perform it, are still at the center of the TMC's mission, 75 years after its founding. "I think most of us feel very, kind of, prized, and sort of honored to be here," Shields says. He adds with a laugh: "As composers, we're taken seriously, in a way that maybe some of us haven't been elsewhere."